The Radnor Hall guidelines. Each dorm had its own set of guidelines. Dorm life and culture were characterized by a tension between allowance for individualism, and a strong sense of group unity and governance. Until the construction of Rockefeller in 1904, each dormitory was named for a Welsh county, a scheme that overlaid a geographical and governmental model of society onto college life. Much in the style of separate counties, individual dorms developed tight-knit communities and identities, perhaps in part because of the extent to which daily life was shaped by structures within each dorm. In addition to the separate student rooms, each dorm was outfitted with a warden, a kitchen, a dining hall and staff, maids, porters, and a communal living area. 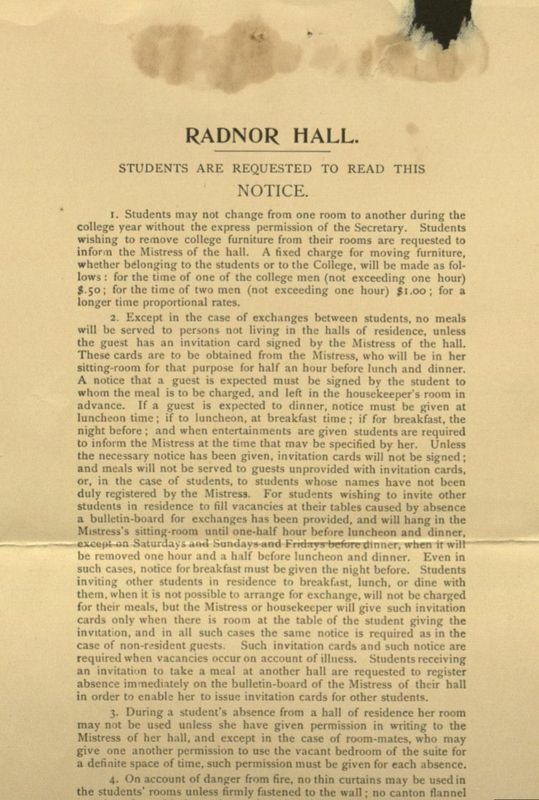 The rules and behavioral expectations were closely regulated: students were instructed on the protocol in notices like the Radnor Hall guidelines, pictured on the left. These documents dictated many aspects of students' interactions within social structures, such as the specifics of how they were to interact with maids, porters, and wardens. For example, students were to hire washerwomen in order to have their clothes laundered and were not to give them to the maids. Meal instructions were also quite specific and are addressed in more depth later in this section. Despite the emphasis on bold intellectual innovation, women scholars were still highly supervised in their social and extracurricular environments. This led to an odd hybrid of supervisory tasks to be performed by the wardens, as noted by former warden Hilda Worthington Smith, who described her duties as “a curious combination of housekeeping, social responsibilities, health supervision, and advice to students on matters academic and personal.". This section explores dorm culture in relation to domestic identities and community, examining the ways in which dormitories both permitted freedom and created boundaries.